Perfect for breaking down larger cuts of meat and poultry as well as dicing, mincing and chopping tough vegetables and fruits. Easily scoop diced food onto the extra wide blade for simple transfer from cutting board to pot or pan. Now you are slicing with power. DALSTRONG POWER! Versatile multi-purpose cleaver featuring outstanding craftsmanship, cutting-edge technology, stunning design elements, and premium materials. Peak performance has never looked so good at this price. Incredibly razor sharp cleaver, full-tang, imported high-carbon German steel with a hand polished edge at 18 degrees per side. Engineered to perfection at 55 Rockwell hardness and hand polished to a satin finish. Carefully tapered for improved hardness, flexibility, and minimal slicing resistance. Tall blade height provides useful knuckle clearance. 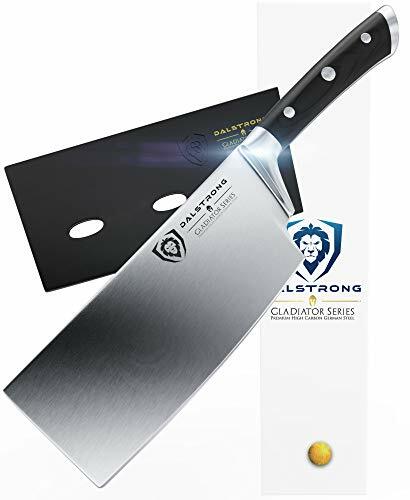 Take Pride in your Knives: See why thousands of professional chefs and home cooks love and trust the DALSTRONG DIFFERENCE. 100% SATISFACTION OR MONEY BACK GUARANTEE, try it risk free, we know you'll love it! If you have any questions about this product by Dalstrong, contact us by completing and submitting the form below. If you are looking for a specif part number, please include it with your message.